In total Alpha Rail maufactured 100 linear metres of 1500mm high vertical bar metal railings which were installed around the frontage of the show home development, located on the river front basin. Alpha Rail also manufactured a number of single leaf and double leaf gates that were installed to provide secure access to the newly built canalside dwellings. To cope with the increased popularity of cycling, Alpha Rail also installed five Sheffield Cycle Stands. The stands were supplied galvanised and set into concrete foundations. 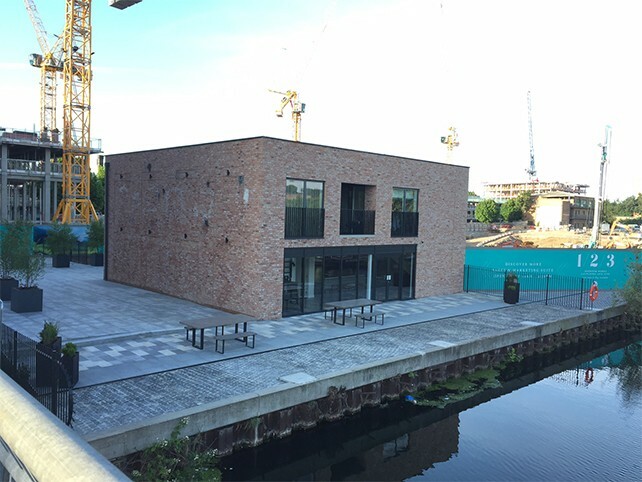 Located in Hackney Wick, Fish Island Village is a canalside community development designed for entrepreneurs looking to relocate their business or for homeowners looking for a unique place to live. The development comprises of a collection of 1,2 and 3 bedroom apartments ranging from £470,000 to £900,000 in price, in addition to a number of unique work space designed for small local businesses. Situating in an area famous for its independent cafes, bars and warehouse pop up art galleries, Fish Island Village was designed and built with the local industrial heritage and architecture in mind. Alpha Rail was given the brief to manufacture vertical bar metal railings that would be installed in front of the on site show home development and provide a protective barrier from the waters edge. "“The Fish Island Village project is a unique development in the heart of a busy London borough. The service Alpha Rail has provided was incredibly professional and very time efficient, especially with so many contractors on site and working to a tight time deadline” "